Tej Pratap's assertion come in the backdrop of a reports of rift in the Lalu Prasad-Rabri Devi family over the growing clout of their younger son Tejashwi Yadav. Tej Pratap said that he would start campaigning in Pataliputra for Misa Bharti from today itself. Tej Pratap Yadav, the elder son of Lalu Prasad, on Thursday out of turn said that his eldest sister Misa Bharti will contest the Lok Sabha elections from Bihar's Pataliputra. Speaking at his daily Janata Durbar in Patna, Tej Pratap said that he would start campaigning in Pataliputra for Misa Bharti from today itself even as the RJD is yet to come out with any official word on the candidature for the seat. 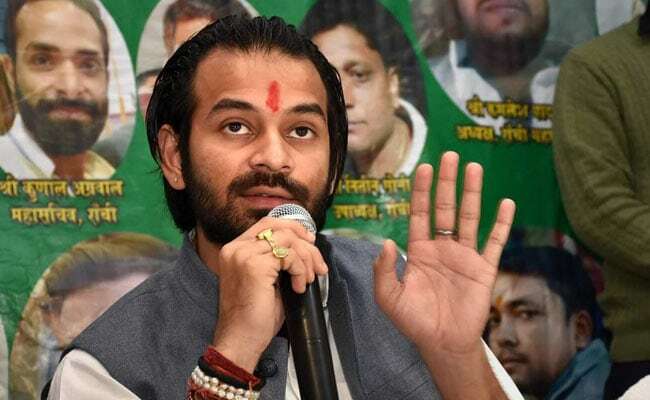 Responding to queries about a recent statement by Maner MLA and chief RJD spokesman Bhai Virendra expressing his desire to contest from the seat, Tej Pratap said, "The people of Pataliputra want Misa didi. Voters cast their votes in the name of Lalu Prasad. Neither Bhai Virendra nor I can do anything about it." "Bhai Virendra had not got a ministerial berth and may be that is why he suffers from anxieties," Tej Pratap told reporters. Bhai Virendra is known to be close to Tejashwi Yadav. The Pataliputra seat that was carved out in the 2008 delimitation is seen as a prestige issue for the "first family" of the Rashtriya Janata Dal (RJD) as both Lalu Prasad and his daughter Misa Bharti have unsuccessfully contested from there. While Lalu Prasad had lost the Pataliputra set to Ranjan Yadav in 2009, who was contesting on a Janata Dal (Secular) ticket, Misa Bharti lost the seat to Ram Kripal in 2014. Although Tej Pratap and Misa Bharti, who is currently a Rajya Sabha member, have repeatedly denied reports of any troubles in the family, speculations are rife about the elder siblings feeling slighted under the shadow of the younger Tejashwi Yadav. Tej Pratap and Tejashwi made their electoral debut simultaneously in the 2015 assembly elections in Bihar. While Tej Pratap was made a cabinet minister, Tejashwi was appointed as the deputy chief minister. Tejashwi Yadav has emerged as the party's de-facto leader in the absence of Lalu Prasad. When the RJD lost power after Nitish Kumar quit the ruling alliance, Tejashwi was made the leader of opposition in the Bihar assembly.